STABOS is the Polish trading family company of well established position in the market. Since 2003, the beginning of its activity, STABOS plays important role in satisfying the needs of our customers. Highly motivated and committed team as we are sets itself ambitious targets to extend continuously the range of offered products and to find new outlets. We cooperate with companies in many countries across all continents in the world. The areas of our biggest activity comprise: bioenergy and forage products. STABOS’s areas of activity comprises production, acquisition and sale of agro biomass and biomass for power and heat generating sectors and covering the needs of the pulp-paper industry plants, manufacturers of fiberboards and chipboards. We are the strategic supplier of agro biomass and biomass for power and heat generating plants in north-western Poland. Since 2013 STABOS successfully operates in the fodder market. STABOS ensures reliability and professionalism in the scope of products and services offered to all of its customers through the process of continuous improvement of quality, flexibility, response and cost optimization of delivery of products most efficient in respect of their energy value. Thanks to the professional experience and personal commitment of the individual staff the targets set by the company are achieved as intended. STABOS in north-western Poland owns 2 hard-surfaced, enclosed and monitored twenty-four hours storage yards of 7,5 ha total area outfitted with electronic weighbridge, loading equipment (telescopic loaders and forklifts) allowing for the delivery of products in time and to the agreed location. In September 2016 in the locality of Przelewice (zachodniopomorskie) we have put into service the professional storehouse for supplements for fodders that has allowed us to increase our competitiveness in the market. STABOS collaborates with 132 transport companies across Poland and Europe. Our suppliers for the biomass are 24 large and medium size sawmills, 12 manufacturers of the garden accessories, 4 furniture industry factories, 10 biomass producers including energy plant growers. We also cooperate with the Regional State Forest Administrations. As regards forage supplements we cooperate only and exclusively with dependable companies operating internationally. The Company obtained FSC® (FSC® C128045) certificate confirming that products covered by this certificate originate from timber from well managed forests that provide environmental, social and economic benefits. 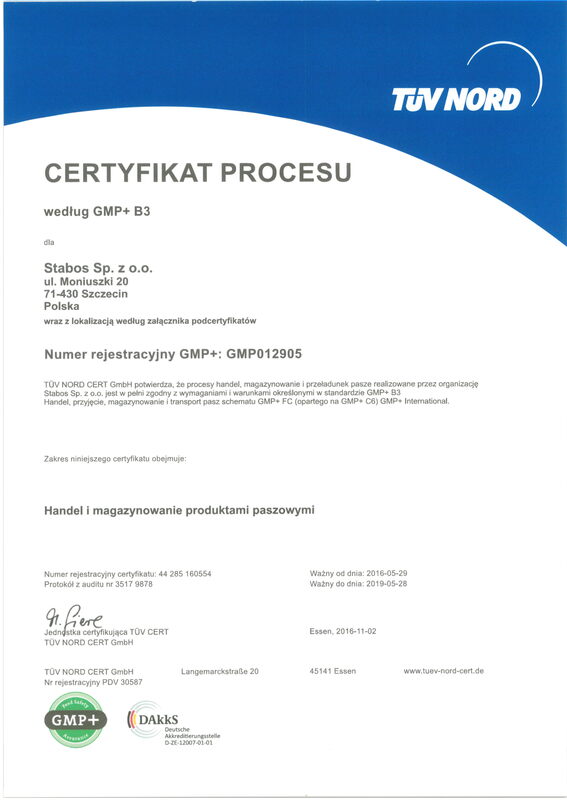 Moreover we hold as STABOS company or trough the group companies the following certificates: GMP+ B3 for trading, acceptance, storage and transporting of the forage , PEFC for sustainable forest management, ENplus for the certified producer of a wood pellet and ISO 50001:2011 for the efficient energy management.